As every year, the President of the Confederation addresses the Swiss Abroad on its National Day. 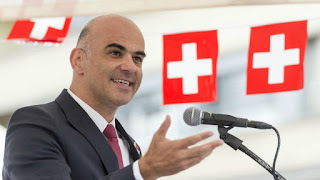 On August 1st, 2018 it is Alain Berset paying his respects to the citizens of Switzerland's 3rd largest community after Zurich and Bern. The Swiss abroad would be the most divers of all canons but we are all united by our view onto Switzerland. The speech comes in 4 different languages: German, French, Italian and English even though the fourth National language is not English but Romansch. The English version it targeted towards to Swiss Abroad who gather in Swiss clubs and organisations across the globe to celebrate and connect. How do you celebrate August 1 abroad? Share your Swiss National Holiday photos with the hashtag # 1AugustAbroad.